$4 for a 20-ounce bottle of water. $3 for a snack bar. $10 for a beer. $14 for a burrito. These aren’t receipts from some inflation-ridden future hellscape. They’re the prices you’ll pay for those items right now, today, at the airport. Some of these tips require advance planning. Others are more opportunistic in nature. How many will you try on your next vacation or business trip? You Might Also Like: Looking for more tips and tricks to save beyond the airport concourse? Check out our comprehensive post on reducing the cost of international travel. Don’t overlook the cost of getting to and from your origin and destination airports, especially if public transportation isn’t available or practical. The first rule of getting to the airport is: If you can take public transit, do. If you live in a suburban or rural area far from the nearest reliable bus or train line, door-to-door public transit simply isn’t possible. Ditto on the other end of your voyage, if you’re staying in a remote resort not well-served by cheap conveyance. And excessive baggage complicates even relatively straightforward transit hops. But if your trip takes you from one urban neighborhood to another, and you’re not carrying your entire wardrobe in tow, public transit is the way to go. If you’re staying at a name-brand hotel or upscale independent hotel near a major airport, inquire about complimentary airport shuttle service. In some countries, including the United States, it’s customary to tip the driver and the person who helps carry your bags, if they’re not one and the same. But shelling out a few dollars in cash is a lot better than paying $40 or $50 for a one-way taxi. Speaking of taxis: Unless they’re prohibited in your origin or destination, or the airport-imposed surcharge is prohibitive, opt for a rideshare like Uber or Lyft over a traditional taxi. In the past, I’ve saved anywhere from 25% to 50% with this simple move. Beyond airport surcharges, the biggest potential wrinkle is surge pricing during periods of peak demand – when you’re facing a 100% or 200% surge, a traditional taxi is probably a better bet. If you must drive to the airport, park in the discount or economy lot or ramp. Virtually every major airport has at least one, usually located near an auxiliary terminal or somewhere just beyond airport property. Some major airports have multiple discount lot tiers. Look for privately owned, off-airport lots that charge a fraction of full-price, terminal-connected lots. If you can’t avoid checking bags, prepay the baggage fees. Many carriers, including most discount airlines, cut baggage fees when flyers pay in advance. Alternatively, apply for a travel rewards credit card with baggage fee perks. Many branded airline cards, such as Gold Delta SkyMiles Credit Card from American Express, waive baggage fees for the cardholder’s first checked bag on every flight – and sometimes extend the break to traveling companions. Cards that don’t specifically waive baggage fees may allow cardholders to put general-purpose travel credits against airline-imposed bag charges. Don’t run afoul of overweight bag fees in your quest to pack as efficiently as possible. These charges can dwarf checked bag fees. On domestic routes, United Airlines charges anywhere from $100 to $200 per overweight bag, depending on the egregiousness of the offense. International surcharges can be even steeper. Ask your airline about policies for heavy sporting equipment, such as skis and golf clubs. Under virtually no circumstance should an ordinary traveler visit a currency exchange kiosk or bureau at the airport. Changing dollars for local currency is a great way to lose anywhere between 6% and 8% of your pile. Head past the exchange kiosk to the nearest ATM, where withdrawal and conversion fees will be lower (though still pricey). Better yet, wait until you’re out of the airport and head to a regular bank ATM, where withdrawal fees may be lower. Short layovers afford meager opportunity to spend, and that’s just how frugal travelers like it. Still, a thrifty plan makes all the difference, particularly when you’re hungry. When you pack your own sustenance, it’s much easier to resist that $14 burrito. Check with the Transportation Security Administration and whatever international airport security entities you’ll encounter for guidance on checkpoint-safe packaged food items. Dry, individually wrapped items, such as snack bars, should be fine. Loose noshes, such as nuts and trail mix, should pass muster in sealed plastic bags. Food alone might not get you through your layover, especially if you have long flights lined up on either end. Pack any other convenience items you expect to need during your journey: over-the-counter medications, chewing gum, earplugs, earbuds, travel pillow. These travel necessities carry obscene markups at terminal newsstands. Talk about obscene markups. Bottled water is a bad deal anywhere, but the situation is especially egregious at newsstands and other airport points of sale. I wasn’t exaggerating up top: I’ve grudgingly forked over $4 for a 20-ounce bottle of Dasani water, which is literally purified tap water, in a fit of parched airport desperation. No longer. These days, I carry an empty aluminum water bottle with me whenever I travel. Most U.S. airports have free bottle refilling stations at select water fountains, so it’s a snap to fill up whenever the need arises. The earbud is a utility at this point. There’s no reason to pay through the nose for the right to listen to music or a movie audio track in private. Buy a cheap pair of earbuds outside the airport and make a point of packing them whenever you travel. If you’re prone to forgetting small items amid the last-minute dash to pack, reserve a second pair exclusively for travel and keep it safely tucked away in your usual carry-on bag. Apply this logic to reading material and entertainment too: paper magazines, e-readers, playing cards, board games, digital media. Never lose sight of the overriding imperative: avoiding emergency newsstand purchases at all costs. Most airports offer free Wi-Fi in some capacity. Sure, it’s often time-limited and intentionally slow, but it should be sufficient for basic Internet browsing. Download episodes or movies ahead of time to avoid suboptimal streaming performance. If the Wi-Fi isn’t great in your terminal and your data plan has plenty of room to run, use your network’s LTE coverage to browse or stream. For activities that require larger screens, try turning your phone into a wireless hotspot. Just know that this won’t be an option overseas without an international data plan. Leisurely layovers mean more chances to spend. Follow these tips to reduce temptation and control your spending on awkwardly long airport interludes. 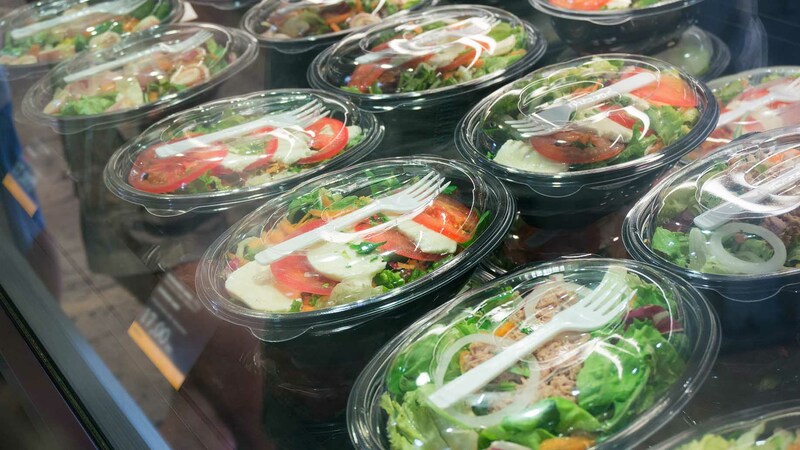 Six hours is a long time to wait in an airport without a square meal, especially if your airline is too stingy to serve a complimentary meal in flight. It might be too long to skate by on packaged snacks alone, no matter how plentiful or calorie-dense. But it’s not too long to give in and sit down at a full-service restaurant, where you’re virtually guaranteed to pay too much for your portion. When I deplane ahead of a long layover, I head straight to the nearest grab-and-go kiosk and pick up a prepacked sandwich or wrap. It’s not fancy, and it’s not as cheap as a snack bar, but it’s enough to keep me going until I’m safely at my destination or engaged in the next leg of my journey. And it usually sets me back less than $10. That’s not cheap, by any means, but not a blatant rip-off like most full-service airport restaurants. The prospect of killing a couple hours in the bar is tempting for some, but it’s probably the purest money-waster (short of luxury shopping – see below) in the entire airport. High-visibility airport watering holes prey on captive travelers – some bored, some nervous – marking the minutes until boarding time. They charge a hefty premium over neighborhood bars and restaurants: anywhere from 25% to 75% more than prevailing local prices, in my experience. If you must hang out in an airport bar or full-service restaurant, skip the strong stuff and order soda or water. Or see if there’s an outside seat with an unobstructed view of whatever’s on TV, which may be all you’re after anyway. Very little good comes from lingering in overpriced airport specialty shops. If you have no intention of buying anything, why waste time on an aspirational circuit of your layover terminal’s mini-mall? Do something more productive with the interlude. The duty-free shop’s inventory is usually a bit more pragmatic than the branded luxury boutique’s. But only a bit. If you do take a quick spin through the duty-free shop, limit your interest to items that you a) definitely plan to use on your trip or at home, b) would almost surely spend more on outside the terminal, and c) would likely struggle to find in your hometown (or country). In my experience, this narrows it down to fancy booze, semi-practical souvenirs (like decorative plates), and local novelties (such as specialty teas). Whenever I have more than an hour of unstructured airport time, I break out my laptop and put on my productive hat. I’ve done some of my most creative work amid the anonymous thrum of terminals in Chicago, Dallas, and Bangkok. Before you follow my lead, crunch the numbers on premium Wi-Fi access to confirm that you’ll recoup whatever you need to shell out to connect. And make sure you’ll have enough running room to get stuff done. You don’t want your Internet connection to cut out in the middle of a file upload. It’s easy enough to break long layovers into shorter segments. The trick is managing your spending during each part of your interlude – or sleeping through enough of it to make it a de facto “short” layover. Airport lounge memberships aren’t for everyone, and their full-year price tags are apt to give all but the most profligate of casual travelers pause. For regular travelers, airport lounges are surprisingly cost-effective. If you’re a high-flying travel loyalty club member who almost always flies with a specific airline, you can safely opt for a branded membership like Delta Sky Club ($495 per person, per year). If you’re airline-agnostic, as most frugal travelers are, opt for an unattached marque like Priority Pass ($99 to $399, depending on access privileges). Airline lounges are typically fewer and farther between, anyway: Sky Club has around 50 locations in the U.S., while Priority Pass has more than 1,000 worldwide. You don’t have to buy a membership to visit an airport lounge. One-time passes for coach-ticketed passengers generally run $59 to $69, depending on the lounge, though some premium travel credit cards offer limited numbers of free or discounted passes each year. Luxe travel cards, such as The Platinum Card from American Express, usually include at least one airport lounge membership, including access to The Centurion Lounge in select airports in the U.S.
Airport lounge visits’ value grows with the passage of time. Though amenities vary, many lounges offer free food and drinks – including alcoholic beverages, in some cases – plus business services, such as free copying and Wi-Fi, and creature comforts like massage chairs and showers. If you can post up in a lounge for six or nine hours, you’ll almost certainly earn back your entry fee. I’ll admit it. When I’m staring down a full day at the airport, I usually give in and sit down for a proper restaurant meal. I control my spending by adding airport meal planning to my pre-trip checklist. Once I’ve nailed down all the major elements of the trip itself, such as where I’m staying each night and how I’m getting around my destination, I turn my focus to layover sustenance. Scan your layover airport’s website for dining options. Then, check Groupon and other social coupon sites for active discounts and deals at your favorite spots. Call restaurants directly to confirm that they’ll accept coupons – even if they’re part of a larger chain, airport restaurants sometimes play by their own rules. If you can’t find any active coupons, don’t worry. Just take a closer look at the menus and figure out the most appealing, cost-effective options. When you finally arrive, stick to the plan. You Might Also Like: Looking to reduce the cost of your non-airport restaurant meals? Check out our post on saving money at restaurants. Airport terminal gyms are increasingly popular in the U.S. and abroad. According to USA Today, Baltimore-Washington International Airport, near Washington, D.C., has a state-of-the-art fitness center. San Francisco’s main airport has two yoga rooms. Before you land, check your layover airport’s fitness options – and, if something fits the bill, remember a fresh change of clothes in your carry-on. If your layover airport doesn’t have a terminal gym, no worries. I’m partial to brisk, extended walks on longer layovers. You can walk for miles in big airports, after all. Admittedly, it’s hard to breeze through a terminal with two or three bags in tow, but you can always take stationary bag-sitting turns with your traveling partner. You Might Also Like: Terminal circuits can’t cut it for everyone. If you’re an exercise buff, check out our post on the top spa and fitness vacations for frugal travelers. At this point, you might as well find an apartment. Just kidding. But the benefits of leaving the airport on a very long layover, or stopover, could outweigh the hassles. If you play it right, you’ll save money by heading into town, even after accounting for transportation costs. Leaving the airport on a stopover isn’t for everyone, especially on international journeys. Navigating border controls is a nightmare in many parts of the world. In countries that require entry visas from American visitors, it’s impossible without advance planning. All that’s to say that this section includes tips for extended layovers inside and outside the airport. Take your pick – and enjoy your time on the ground! When you’re exhausted, stretching out on a bag-turned-pillow and a hard terminal floor sounds like heaven. If you’re not that tired, see if you can catch some shut-eye in an airport lounge or “capsule hotel.” USA Today lists 16 major airports, including Atlanta and London-Gatwick, with pay-by-the-hour sleeping pods big enough for a single traveler and their bags. 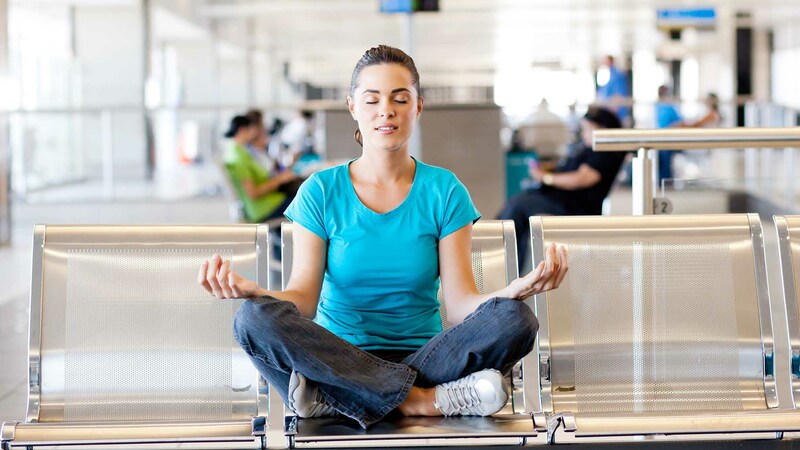 Many airports have meditation rooms where travelers can recharge and re-center. Observer lists nine major airports with yoga or meditation centers, including New York-JFK and Miami. Talk about a relaxing way to kill an hour or two. Talk to friends and family who’ve spent time in your stopover city, or check travel blogs for cheap sightseeing ideas. I’m partial to urban parks, myself: If the weather is nice, you can spend hours outdoors in a stopover city without spending a dime. Free museums and zoos are great too. If you’re planning to spend the night in your stopover city, skip the hotel and opt for a cheap short-term rental apartment or hostel instead. 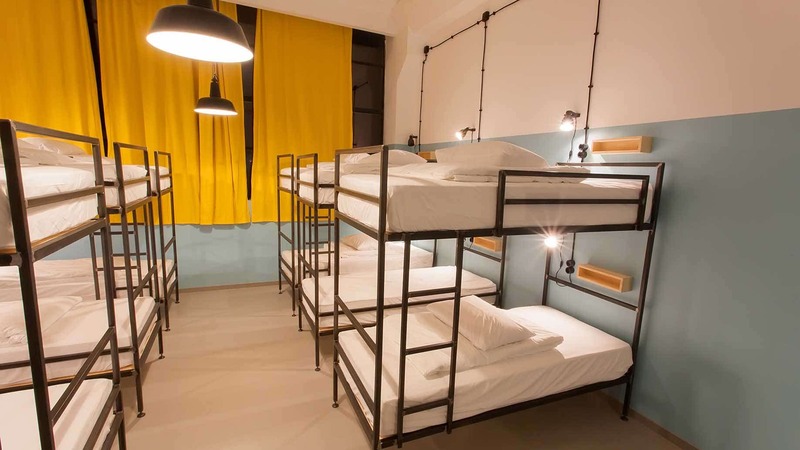 Even in major cities, you shouldn’t spend more than $30 or $40 for a basic apartment room, and you can probably get away with even less in a bunk-style hostel room. This isn’t as counterproductive as it sounds. Though improved software and scheduling practices have dramatically reduced overbooking rates since the turn of the century, it still happens – especially to solo travelers. If your travel schedule is flexible – perhaps you’re heading home, but you don’t have to work the next day – then consider voluntarily giving up your seat on an overbooked flight. You’ll receive some cash compensation from the airline, usually enough to offset the cost of the flight, and help finding a hotel to spend the night (if necessary). The one time this happened to me, I lost about six hours and gained $850 on a $300 flight – a $550 profit. Not bad! If all goes well, you’ll spend just a small fraction of your total trip time at the airport. That’s the way it should be – no matter how well you plan your layover, it’s usually better on the outside. Of course, the more time you spend in your actual destination, the more thought you’ll need to give to trimming your non-airport expenditures. If you haven’t already done so, apply for a cash back credit card to supplement the travel rewards you’re (hopefully) earning on your hotel stays, airfare, and car rentals. And, by all means, share your favorite frugal travel tips in the comments below. How do you save money at the airport?